This project was approved by the County Board on Feb. 23, 2019. 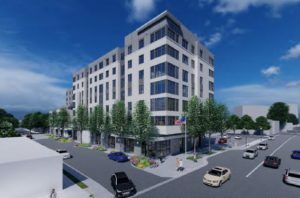 Arlington Partnership for Affordable Housing (APAH) and the American Legion propose a new 7-story, 160-unit multi-family building with 96 underground parking spaces. A new American Legion Hall will be located on the ground floor. Bonus density is requested for the provision of on-site affordable housing. A modification to the parking regulations is requested.